Biography as so detailed and extra stuffs such as Wallpapers, Pictures and ASCII Art for more fun. Jaron Zepel Lanier, born on May 3, 1960. He is a computer scientist, composer, visual artist, and author. 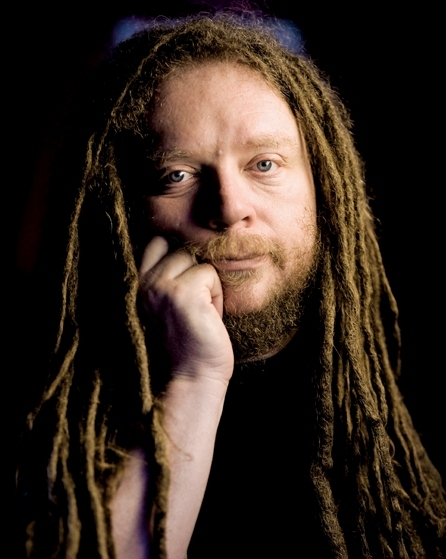 Jaron Lanier scientific interests include biometric information architectures, user interfaces, heterogeneous scientific simulations, advanced information systems for medicine, and computational approaches to the fundamentals of physics. He collaborates with a wide range of scientists in fields related to these interests. Lanier’s name is also often associated with Virtual Reality research. He either coined or popularized the term ‘Virtual Reality’ and in the early 1980s founded VPL Research, the first company to sell VR products. In the late 1980s he led the team that developed the first implementations of multi-person virtual worlds using head mounted displays, for both local and wide area networks, as well as the first “avatars”, or representations of users within such systems. While at VPL, he and his colleagues developed the first implementations of virtual reality applications in surgical simulation, vehicle interior prototyping, virtual sets for television production, and assorted other areas. He led the team that developed the first widely used software platform architecture for immersive virtual reality applications. Sun Microsystems acquired VPL’s seminal portfolio of patents related to Virtual Reality and networked 3D graphics in 1999. From 1997 to 2001, Lanier was the Chief Scientist of Advanced Network and Services, which contained the Engineering Office of Internet2, and served as the Lead Scientist of the National Tele-immersion Initiative, a coalition of research universities studying advanced applications for Internet2. The Initiative demonstrated the first prototypes of tele-immersion in 2000 after a three-year development period. From 2001 to 2004 he was Visiting Scientist at Silicon Graphics Inc., where he developed solutions to core problems in telepresence and tele-immersion. He was Scholar at Large for Microsoft from 2006 to 2009, and Partner Architect there from 2009 forward. Lanier received an honorary doctorate from New Jersey Institute of Technology in 2006, was the recipient of CMU’s Watson award in 2001, was a finalist for the first Edge of Computation Award in 2005, and received a Lifetime Career Award from the IEEE in 2009 for contributions to Virtual Reality. Lanier is a well-known author and speaker. His book “You are not a gadget” will be released in early 2010 by Knopf in the USA and Penguin in the UK. “Jaron’s World” is his monthly column in Discover Magazine, currently on hiatus, and devoted to his own wide ranging ideas and research. He writes and speaks on numerous topics, including high-technology business, the social impact of technological practices, the philosophy of consciousness and information, Internet politics, and the future of humanism. His lecture client list has included most of the well-known high technology firms as well as many others in the energy, automotive, and financial services industries. His writing has appeared in The New York Times, Discover, The Wall Street Journal, Forbes, Harpers Magazine, The Sciences, Wired Magazine (where he was a founding contributing editor), and Scientific American. He has edited special “future” issues of SPIN and Civilization magazines. He is one of the 100 “remarkable people” of the Global Business Network. IN MUSICAs a musician, Lanier has been active in the world of new “classical” music since the late seventies. He is a pianist and a specialist in unusual musical instruments, especially the wind and string instruments of Asia. He maintains one of the largest and most varied collections of actively played rare instruments in the world. Lanier has performed with artists as diverse as Philip Glass, Ornette Coleman, George Clinton, Sean Lennon, Vernon Reid, Terry Riley, Duncan Sheik, Pauline Oliveros, and Stanley Jordan. Lanier co-composed the soundtrack to “The Third Wave,” a documentary released in Sept. 2009 to critical acclaim after winning awards at film festivals around the world. Lanier’s work with acoustic “world” instruments can be heard on many other soundtracks as well, including a prominent role in “Three Seasons” (1999), which was the first film ever to win both the Audience and Grand Jury awards at the Sundance Film Festival. He also writes chamber and orchestral music. Current commissions include a symphony for the Bach Festival Orchestra. Recent commissions include: “Earthquake!”, a ballet which premiered at the Yerba Buena Center for the Arts in San Francisco in April, 2006; “Little Shimmers” for the TroMetrik ensemble, which premiered at ODC in San Francisco in April, 2006; “Daredevil” for the ArrayMusic chamber ensemble, which was premiered in Toronto in 2006; A concert length sequence of works for orchestra and virtual worlds (including “Canons for Wroclaw”, “Khaenoncerto”, “The Egg”, and others) celebrating the 1000th birthday of the city of Wroclaw, Poland, premiered in 2000; A triple concerto, “The Navigator Tree”, commissioned by the National Endowment for the Arts and the American Composers Forum, premiered in 2000; and “Mirror/Storm”, a symphony commissioned by the St. Paul Chamber Orchestra, and premiered in 1998. “Continental Harmony”, a PBS special that documented the development and premiere of “The Navigator Tree” won a CINE Golden Eagle Award. His CD “Instruments of Change” was released on Point/Polygram in 1994. In 2005 Lanier was selected as one of the top one hundred public intellectuals in the world by readers of Prospect and Foreign Policy magazines. The Encyclopaedia Britannica (but certainly not the Wikipedia) includes him in its list of history’s 300 or so greatest inventors. The nation of Palau has issued a postage stamp in his honor. Various television documentaries have been produced about him, such as “Dreadlocks and Digital Dreamworlds” by Tech TV in 2002. The 1992 movie Lawnmower Man was in part based on him and his early laboratory- he was played by Piers Brosnan. He has appeared on national television many times, on shows such as “The News Hour,” “Nightline,” and “Charlie Rose,” and has been profiled multiple times on the front pages of the Wall Street Journal and the New York Times. ‘Finding Humanity in the Interface: Capacity Atrophy or Augmentation?’ A debate between Jaron Lanier and Will Wright from the Accelerating Change 2004 conference. Checkout the ASCII Art and Pictures of Jaron Lanier in the below link. Extract the Files from WinRAR Archive. Please use Lucida Console font to view the art in Notepad. Before that in Notepad go to Format and Uncheck the Word Warp and then Go to Font and Reduce the Font Size to 3 to 4 pt. Use only Lucida Console Font. I thank you all for spending your precious time on my blog. I also need your support to run this blog even better than now. Post some comments. So that I could be able to know the flaws in my blog. I once again thank all for the visit. PLEASE COMMENT IN ENGLISH !! !